As a startup enthusiastic, I always prefer to become user of it to analyze the entire business setup from the targeted market point of view. Since last couple of weeks Cab Aggregators Ola and Uber both are in lime lights for claiming their effective, efficient and affordable cab service as the best, I thought to be a user of it to analyze if there is any loophole in their system that could lead towards inconvenience of consumers. So, I booked a cab yesterday morning expecting a smooth ride to reach to my destination. But the frustration started since after I received sms stating that ola cab has reached and is waiting for me at my doorstep. I jumped outside to start my ride and reach to the destination on time. But the struggle started since that moment itself. There was no cab and when I called the driver, he was somewhere around half km away from me. After guiding him around 20 mins on phone to reach to the exact location marked while booking, the journey ended up with higher invoice amount than expected. I marked the ride late around 9:40 am via Ola App itself hoping it would be automatically incorporated in the invoice. Based on Ola’s price details, my rough estimation for the bill was – Base price (40 Rs) + Travel Price (9*6 = 54 Rs) + Ride Time (20 Rs from 9:40 to 10:00 am) = 114 Rs. But the Actual Amount Charged was 145 Rs. So it forced me to recheck the bill why there was gap of roughly 30 Rs in a single ride. The ride time charge that was being reflected in the invoice received via email was 40 Rs. So I understood that the ride time was starting from 9:20 am, including the time of 20 min struggle and further 20 mins ride till 10:00 am. Since my concern was why any user should pay any amount of money for the unproductive time like guiding the simplest route to the driver, I decided to contact Ola again and explain the same issue with more elaboration. So at night I again contacted Ola their facebook page hoping that this time they would be able to under the exact problem and resolve it. This time Ola refunded the additional ride time charge of 24 rupees. Before going to sleep I again gave the entire incident a thought. If Ola is charging 10-20 rupees additional per person on each ride what additional amount they are generating. (If per day booking are assumed as 1 million). And what could be the possible reasons for such incidents and their solutions. 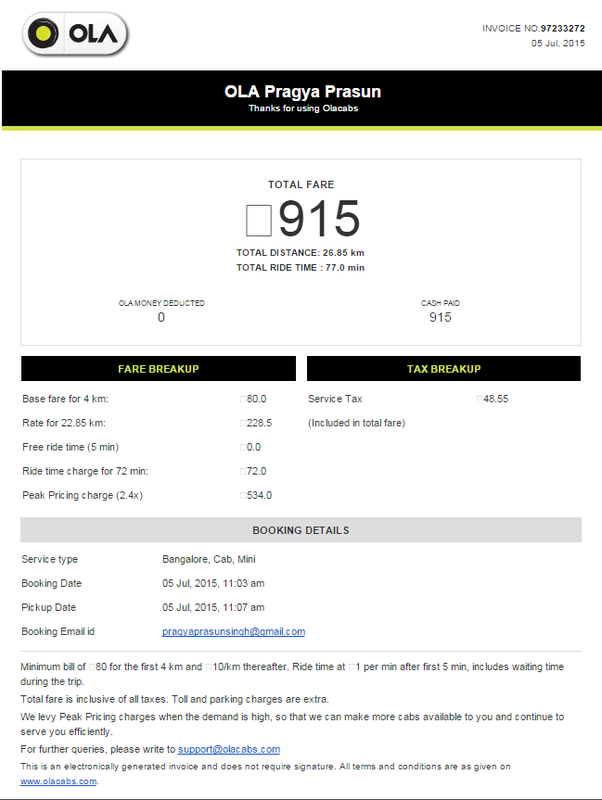 Ola Unethical Practice – It might be that Ola itself is charging the additional amount by counting the ride time in wrong way. Since Ola refunded the amount, probability of such practices is less. Users, who are able to raise the concern, get their invoices revised. Driver Fault – Another possible reason is that the driver marked himself as available at 9:20 and kept waiting till 9:40. User can’t mark the driver availability or ride start time in the App. This control is in drivers’ login only. So the control of start and end of journey shall be given in both hands, driver as well as rider, and based on the unavoidable time differential of both the marked time, invoice shall be generated correctly. Ola users must check the ride start /boarding time marked by driver before starting the ride to avoid additional charges. This site is really Good and In this article I feel the problem with the driver who started the ride . I have used ola many times , they will start only after I entered into the Cab. May be the driver started thinking that he will be there in a minute. PS:Not related to OLA Anyways. If you can , Make a article overcharging in the name of Peak hours . I have seen people charged for 1200 for 9Kms in the name of Peak hours . We are not blaming anyone, but giving a advice to check before riding to avoid any additional charge. If you have faced the problem of over peak time charges, share the details with us. We’ll publish the same. I do not have the exact post where I have read about the complete experience of OLA . They have charged 1200 for 7 KMS . Thanks for sharing the reference links.